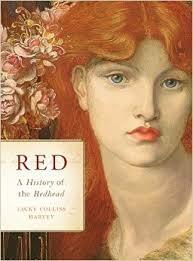 Those who know me won’t be surprised that when I saw a review of Red: A History of the Redhead by Jacky Colliss Harvey, I ordered it immediately and devoured it as soon as it arrived. I wasn’t disappointed – but then again, what guy would ever be disappointed when the topic is redheads? Harvey’s academic background in English and Art History as well as her work in museum publishing make her a natural to do a book like this. But she obviously worked very hard and researched energetically in other disciplines as well – biology, genetics, chemistry, physiology and business among them. Early in the book, Harvey explains the quirky MC1R gene that produces a substance called eumelanin, which makes for dark skin, eyes and hair. Sometimes, however, the gene produces another substance called red or yellow phaeomelanin. It also teams up with another gene, HCL2, to bring forth all sorts of variants in hair, eye, and skin color. Biology dictates that redheads don’t do well in strong sun and tropical climes. They’re more suited to higher latitudes like Scotland and Scandinavia. Their pale skin does a good job of processing Vitamin D from sunlight, and there’s less sunlight up North. The parts I especially liked had to do with history: political, art, and cultural. If I want to understand why things are the way they are now, reading up on history generally provides solid clues. So does re-reading some of the books we had to get through in high school but never really appreciated. Harvey unearths many of those clues. She goes back to Biblical legend as well as to our fourth-grade history and the mythology of ancient Greece and Rome to show how redheads have captivated and intrigued the rest of humanity. Seems it’s always been this way. A fresco unearthed in the home of M. Fabius Rufus – whose name means “red” – in Pompeii depicted Cleopatra with red hair. The author surmises that the painting is probably one of Cleopatra, anyway, and that it’s not very likely that she did have red hair. But the point is that she acted like a redhead, and so was painted that way. Lilith, the legendary lady of creation who thought herself Adam’s equal, unlike Eve, “refuses to lie beneath.” She rebelled and left him to live in the wilderness, and she is frequently depicted with red hair by religious artists. The resurrected Jesus meets with his redhead disciple Mary Magdelene. Then there’s Mary Magdalene, perhaps my favorite Biblical character. I’ve come to believe that she was the truly indispensable disciple of Jesus. Even the Scriptures back this up. She was the first one to whom Jesus revealed himself after his resurrection. But she has gotten a raw deal from the guys who ran the Church in later centuries. They rewrote her story and made her a bad girl. Pope Gregory (the Chant guy), in 591, declared that the “woman cured of seven devils” in Mark’s gospel was actually Magdalene. She took her unguent, “previously used to perfume her flesh in forbidden acts,” to wash Jesus’ feet. She had once “displayed her hair to set off her face,” but now that hair is what dried her tears of repentance. And what color is that hair in devotional paintings? Why, red, of course. Jacobus de Verigine, an early author who compiled the lives of saints, writes that Magdalene was wealthy and “shone in beauty.” Moreover, her sins were her pleasure in looks, and riches, and in “giving her body to ‘delight’ rather than straightforward prostitution.” In other words, she loved it. And so she flouted all of the taboos of the medieval Christian Church. How could the popes and bishops possibly approve of Magdalene’s closeness to Jesus? They didn’t, and so they smeared her – before they also admitted that she repented. 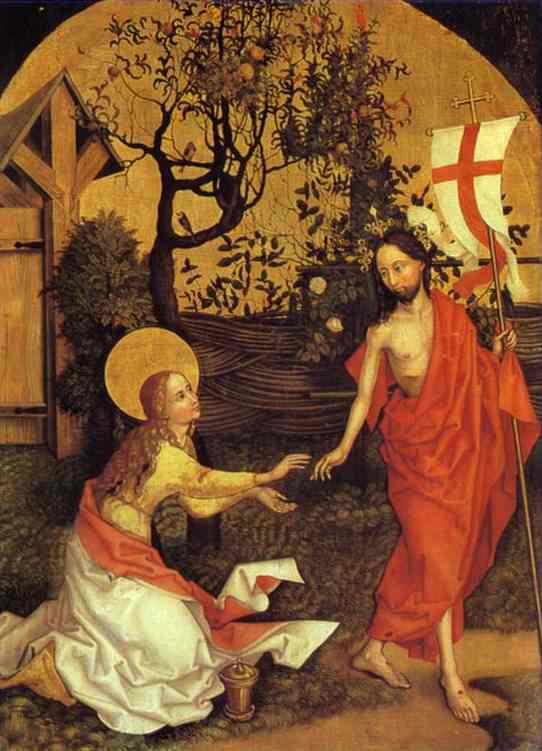 The painting “Noli Me Tangere” (“Don’t Touch Me”) by Martin Schongauer shows a strawberry blonde Magdalene with the risen Jesus on Easter morning. 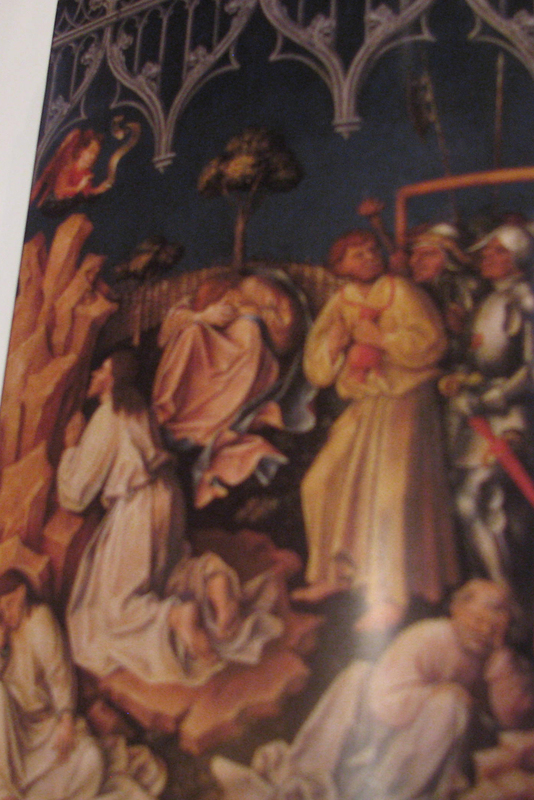 And there was another redhead present at the crucifixion, as shown in “Calvary” by de Messina. The unrepentant “bad thief” is also a redhead. Red-headed Judas leads the soldiers to Jesus in Gethsemane. Going back to the night before the crucifixion, “The Agony in the Garden” painting in the Bavarian National Museum shows a red-headed Judas leading the soldiers towards Jesus. It is but a short step from there to one of the fueling elements of anti-Semitism: the treacherous, redheaded Jew. Those sexual taboos and those attitudes toward red hair didn’t die out in the Middle Ages, either. They remained around for a long, long time, and they haven’t entirely disappeared. There’s much more than religiously-oriented historical discussion in Harvey’s book. But religion has been so powerful in shaping humanity’s behaviors, I thought it worth delving into here. And next time you’re grappling with some thorny issue and ask “What would Jesus do?” think of “Noli Me Tangere.” Jesus would pick the redhead. 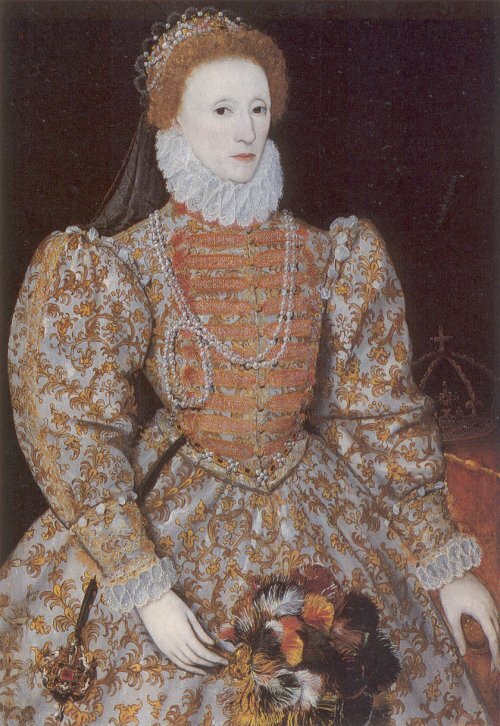 Queen Elizabeth I portrait in Britain’s National Gallery. Other famous and infamous redheads, real and fictional? How about Henry VIII and his daughter, Queen Elizabeth I? She supposedly had eighty wigs, and she liked to be seen in them to play up the connection with her father, who had declared her illegitimate. 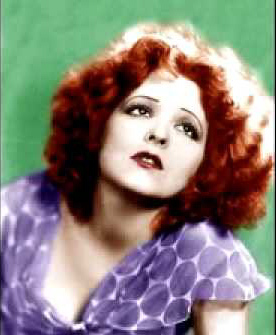 The lists go on and, as we’d expect, pay a visit to Hollywood and its red-haired goddesses: Clara Bow, Rita Hayworth, Lucille Ball, and their many successors in movies. And in cartoons: The Little Mermaid, Jessica Rabbit, and Red Hot Riding Hood. Millions of women want to be like them, and millions of men cheer that development. Red hair tint outsells all other hues. In 1970, L’Oreal sold only two shades of red hair coloring. By 1989, they were up to 16 shades, while Redken had 29 shades of red and Clairol had 43. Lucille Ball once said, “Once in his life every man is entitled to fall madly in love with a gorgeous redhead.” For once, she’s not got any ‘splainin’ to do. The author also quotes a firm named Upstream Analysis, which points out that up to a third of all TV advertising features a redheaded character, but redheads make up only somewhere between 2 and 6 percent of the population. So we all pay attention to redheads. They sell. In the book’s last chapter, where she tells of her visit to Redhead Days in Breda, Holland, Harvey says that “gingerism” endures as one of humanity’s prejudices. I don’t watch “South Park,” so I was unaware of its episode on “Kick a Ginger Day.” OK, agree, kids can be cruel. They will pick on people who are different from them, and redheads are definitely different. But savvy redheads are battling back against bullies and turning negative stereotypes hip and cool. A Canadian comedian responded to “South Park” by co-opting the Canada Dry logo and setting up “Kiss a Ginger Day.” Good for him. Sign me up. Redhead Days brought together 6,000 of them from all over the world. I have to put that event on my bucket list. I’d also love to take the redheaded Jacky Colliss Harvey to lunch, just to learn more about her research and her other work in museum publishing. She has an easy, enjoyable writing style, and she’s done a most interesting book on one of my favorite subjects. He was so renowned and prized as the hairdresser to the Russian court that he did most of his work under military guard. But when he married secretly without first securing Czar Nicholas II’s permission, he had to flee the country. Faktorowicz used his own makeup to fake symptoms of jaundice in order to leave Moscow for America in 1902. His early times in America were tough. A business partner defrauded him of most of his savings at the Louisiana World’s fair. His half-brother became known as “Jake the barber,” a notorious Prohibition gangster who one, literally, broke the bank at Monte Carlo. 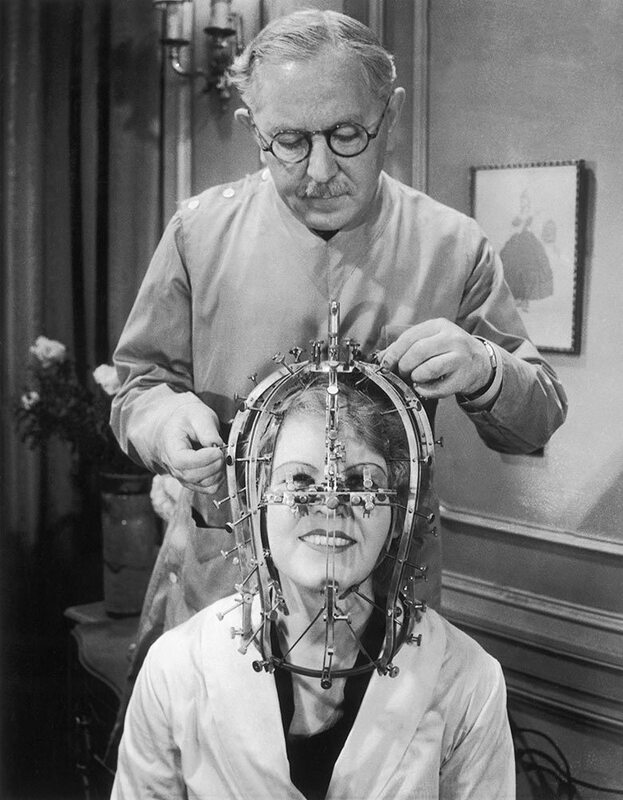 Maksymilian Faktorowicz at work with his “beauty micrometer,” which detected tiny flaws in actor’s faces. Without a treatment of some sort, these flaws would show up on the big screen. The solution? Pancake makeup. 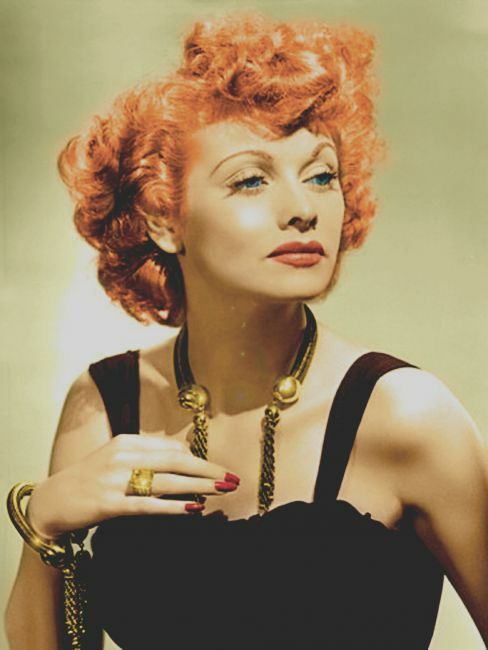 famous redhead; the platinum blonde look of Jean Harlow, which she maintained with a weekly wash of ammonia, Clorox, and Lux soap flakes; and the glorious copper curls of Rita Hayworth. Clara Bow, Hollywood’s “It Girl” (colorized). If, in my next life, I come back as Maksymilian Faktorowicz, I’ll take that as God’s message that I was a good boy in this life, and that I deserve a nice reward. And you know who Maksymilian Faktorowicz is. We’ve all used his products. You are currently browsing the Veteranscribe's Blog blog archives for June, 2015.